This week it will be two years since I got my first dog. I’d always wanted one as a kid but my mum always managed to direct my interest in animals in other ways; mostly with guinea pigs, rabbits and walking all of our neighbours’ dogs. So after a few months in our first house the other half, whos family have always had dogs, felt there was something amiss. 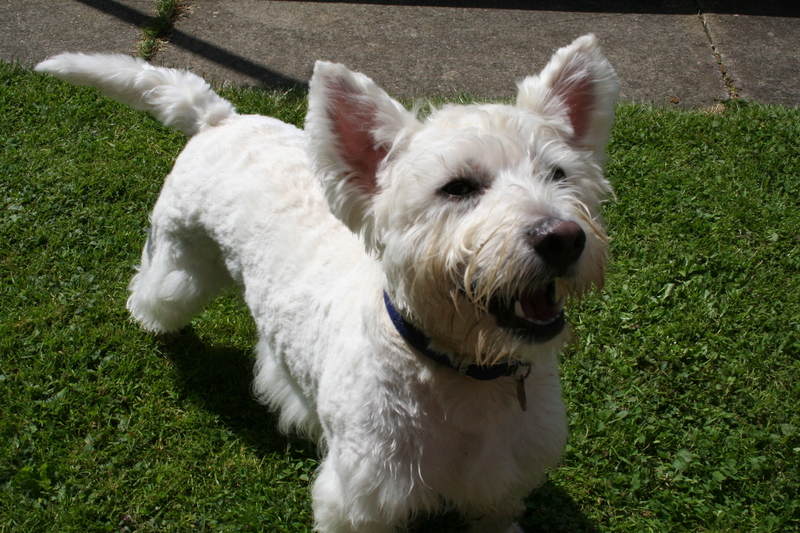 So we searched and researched some more and decided a Westie would suit us just right and one in particular fitted with us straight away. Much deliberation later the name Rocky stuck and our little puppy was everything I ever hoped for when I got my first dog. Now two years on, nothing can cheer me up more after a hard day than the dog greeting me when I get home. He’s like our own personal smiling shadow that follows you round, investigating what you’re up to and wanting to be a part of everything. Even though Rocky feels he has to bark the birds out of the garden, chew at your feet when your trying to get socks on and steal food at any opportunity we wouldn’t want him any other way. His little habits are what make him our special little dog and no one else can ever know him quite like we do now. My life with a dog has begun at a time when I can really appreciate the hard work it takes and also the joy it brings. Honestly, theres nothing quite like a dog licking your face to cheer you up.